An evaluation of continuing medical education programs provides insight into the “hot topics” in medicine. The focus for this review of this information pertains to programs designed to educate health care professionals about newly established therapeutic regimens, protocols, and drug therapies. The following are examples of web links that can be used to evaluate this topic. For this part of the analysis, with the goal of defining effective non-HEDIS measures used for the evaluation of prescription drug information, a standardized evaluation process was engaged in, including a review of some materials extending as far back a ten years in order to determine if any trends in education topics exist. This review of CME program topics and educational content provides us with insights into the current trends in medicine and pharmacy, as well as possible ‘hot topics’ that are in need of monitoring. This methodology is just one of several processes that can be used to define some of the non-HEDIS measures required for efficient evaluations of RxProvider actvities. 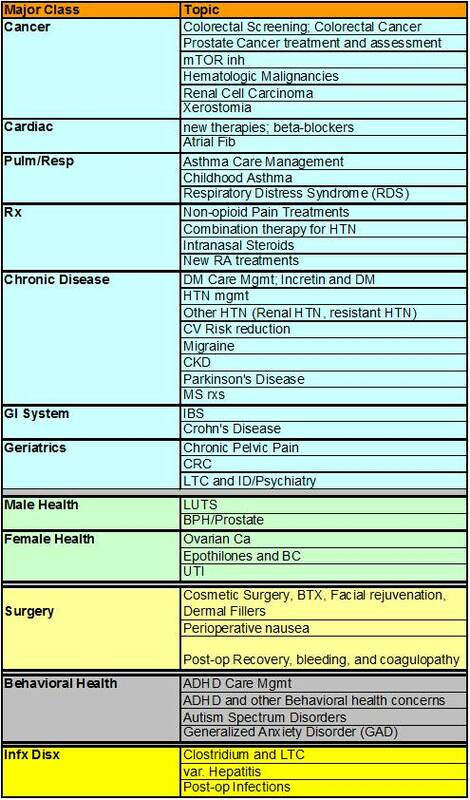 Other possible methods include the use of national programs and events to identify possible indicators, such as the use of Healthy People 2010 contents, a program indicative of CDC related goals and activities, and a series of reviews of special professional groups such as the AMA, AAFP, and ACOG. By adding measures developed using following processes, to HEDIS measures already incorporated into the reporting process, we extend the applicability of this work well beyond the standards that HEDIS and QIA/PIP standards rely upon for evaluating overall program success. We are also now beginning to develop what could be a series of fairly useful outcomes measures that could serve as sensitive indicators of population health changes based on script and claims data. Several methods are used to divide the large listings of programs into subgroups for counting purposes. Each of the methods provides us with similar results, but with different points of view. 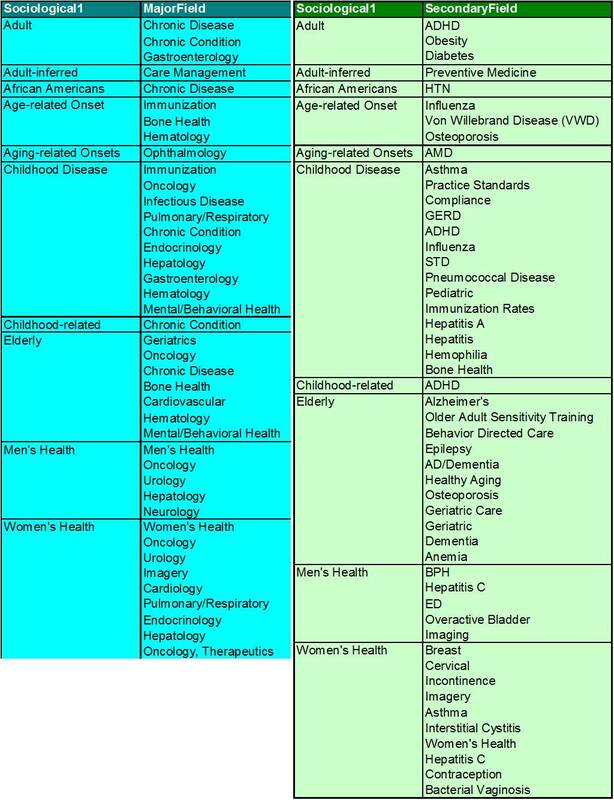 The simplest way to breakdown some of the data was to develop a way to define the most important sociological group related topics that could be assessed as possible non-HEDIS Groups Health Measures. The following is an example of this listing of Groups. The topics are listed in descending order for each Sociological/Age Groups listing. The next method of categorizing important topics involved an analysis of a much broader dataset, many of the contents of which could not be easily defined based on sociologically-defined applications defined by population types. The following tables depict an identical dataset evaluated using different standards, each appearing as separate columns: Major Field and Secondary Field. These provide further insight into how the various subsets of topics can be delineated in terms of value at the teaching and clinical levels. As before, the lists are provided in descending order of popularity or review. Applying a different series of algorithms to the same dataset, with different subcategories, another method was employed to define value of the topic based on a ranked process. The first analysis was done temporally for a 6-year period, detailing those topics which were recurrent over the years of activities under review. 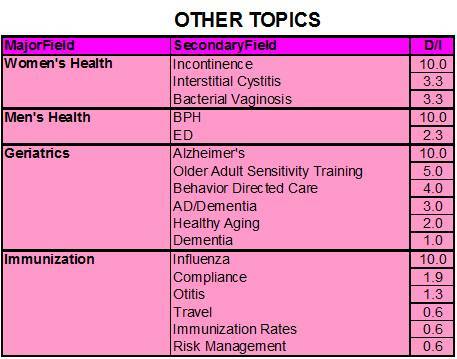 The next series of tables rank subjects using a review of medical topics suggested by subject or program title names. 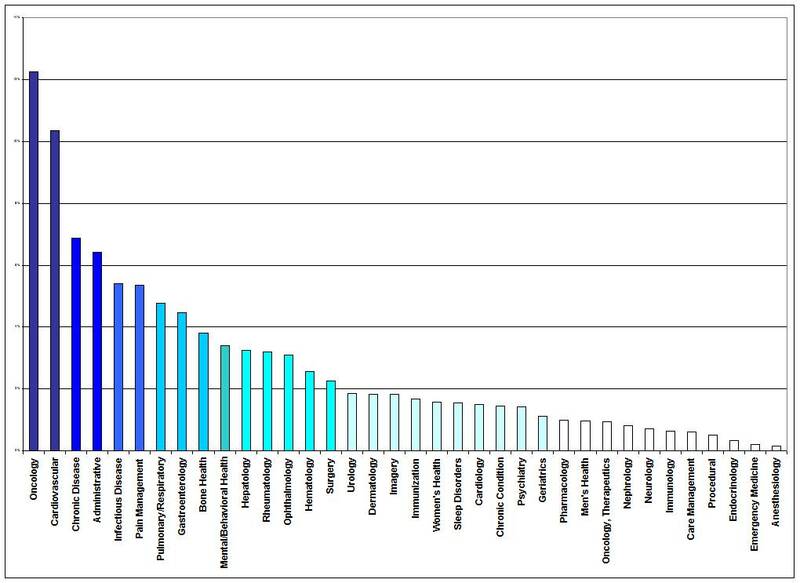 Another way to demonstrate relative importance of groups and their subgroups is to provide a value to their ranking. In the following series of tables, the major categories (table names) are laid out in descending order of priority, with each table providing a numerical value to the ranking that is defined. This method ranks each issue or topic on a scale from 1 to 10, with 10 defined as the highest scoring measure in the particular topic under review (the number of programs focused on this topic). Subsequent topics are scored based on numbers of program for that over the total number of programs for the most common topic reviewed. The following order of this table demonstrate to us where the priorities must lie when developing additional measures to be used for interpreting program/activity outcomes. The closer a D/I value is to 10, the more important the topic is, relatively speaking. 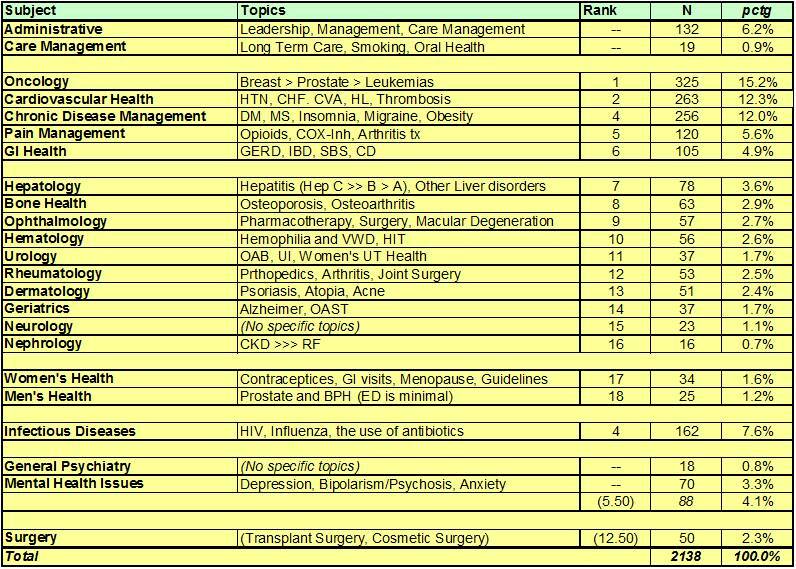 It is important to note here that, like in the above rankings and descending order list, these topics are defined based on a large dataset. Not all program topics are evaluated and included in this analysis, and typically topics with just 1 or 2 hits are excluded, as well as exceptionally low ranking outcomes in longer datasets with frequency values of <5. 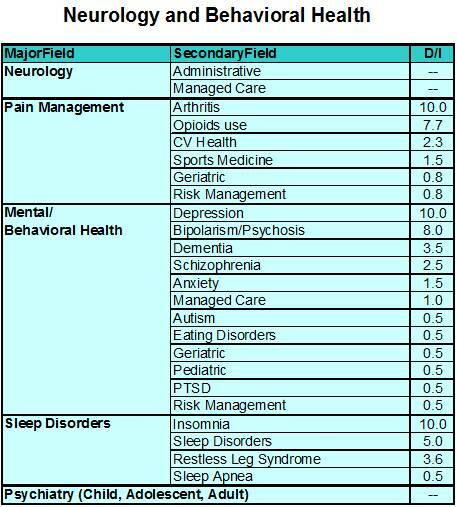 Only the top scoring categories, usually with hits in the dataset >>1, are noted in the following tables. Well over two thousand programs, each program representing numerous class options, along with their related topics and subtopics, were reviewed for this analysis. An estimate of numbers of programs can be made by reassigning the lowest D/I rate a value equal to 2, and then adjusting all scores above by the related multiplier. Each of the above methods could be used to determine whether or not a potential measure can be valuable as a non-HEDIS measure related to Groups Health evaluations. The more the better. A number of these methods of analysis go through standard protocols in order to be evaluated and therefore can be automated or semi-automated. The importance of engaging in these non-HEDIS reviews relates to value of final outcomes achieved. A mediocre review of a large program will be based solely on just one type of measure or measure series, such as a HEDIS set of queries or a standard institutional set of product related queries. The methods developed for these Groups Health studies are for the most part applicable in part to most applications for these evaluations (i.e. 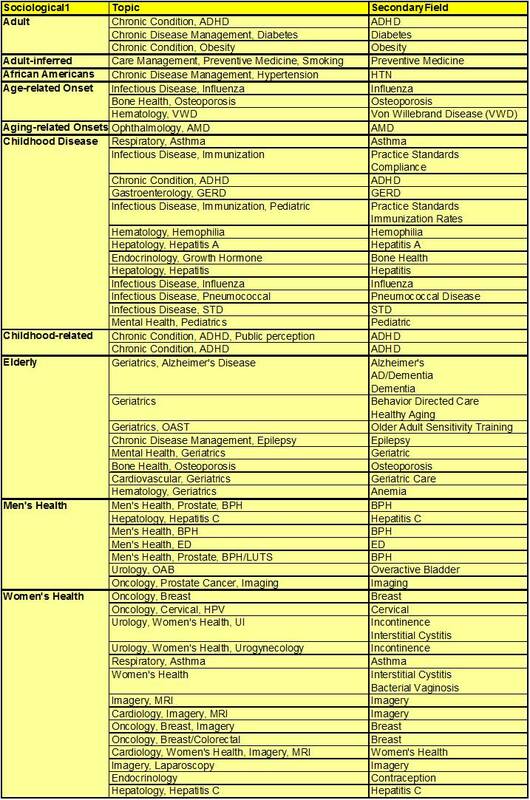 a HEDIS-related, PIP/QIA-related, ACOG-related and even Healthy People 2010 related review and program comparison). The most successful reports require that numerous avenues be taken in order to provide a number of outcomes with numerous applications. 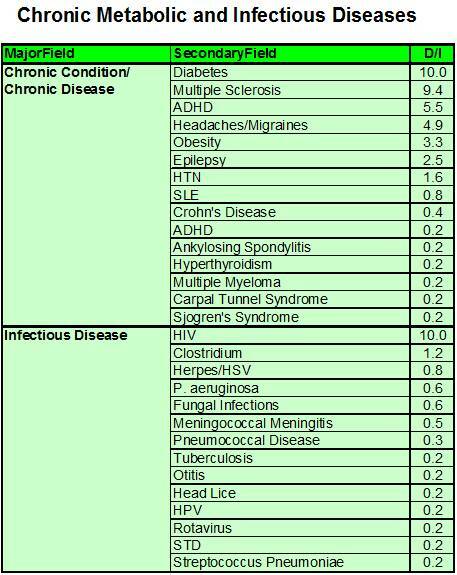 For this reason, HEDIS, PIP, QIA, Healthy People 2010 and various CDC related reviews of population health were reviewed as well to help define these population health measures. The next section reviews these remaining tactics that may be used to produce reports of population health measures aimed at satisfying individual working at the various levels of health care and the health insurance business.